Crepes with salted butter caramel is a classic Breton (Brittany) dessert. Salted caramel has a tangy, rich taste that has garnered a cult following for those with a less-than-sweet tooth, or with one but loves the tingle of salt too. The best thing is that this recipe is so easy to make and delicious too. Process all the ingredients in a blender until the mixture is smooth. 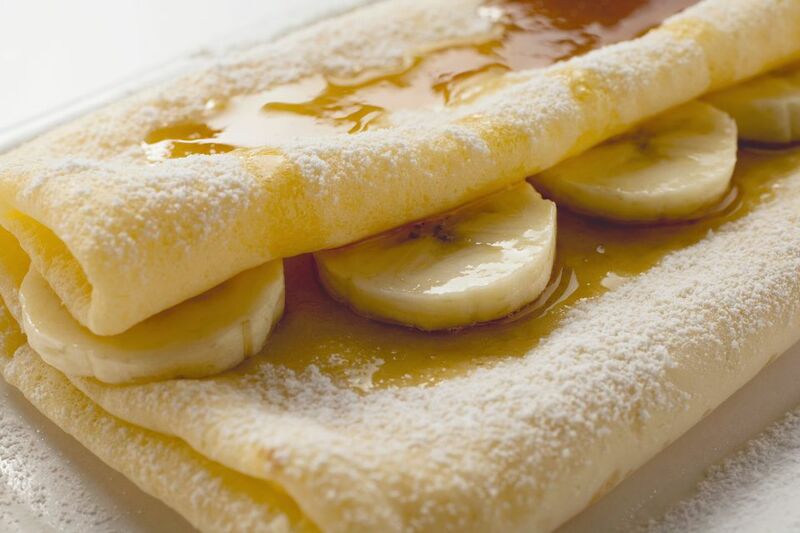 Allow the batter to rest in the refrigerator for at least 20 minutes before making into crepes. Add 3 tablespoons of batter to the pan and swirl until the bottom of the pan is covered with batter. Cook for 1 minute and transfer the cooked crepe to a plate to keep warm. In a saucepan set over medium-low heat, melt the butter in the heavy cream. Immediately remove from the heat and set aside. Place the sugar in a separate saucepan set over medium heat. Sprinkle the water over the sugar and allow it to dissolve over the heat without stirring. As the sugar begins to caramelize, occasionally shake and swirl the pan to evenly distribute the color. When the caramel is a rich golden color, remove the pan from the heat and carefully add the hot cream and melted butter to the caramel. Take care to stand back during this process; the hot caramel will bubble up to the sides of the pan. Return the caramel to the lowest heat setting, whisking constantly. Cook and stir the salted butter caramel for 2 minutes over the low heat. Remove from the heat and season the sauce with the 1/16 teaspoon sea salt; stir until it is dissolved completely. To Assemble the Crepes: Spoon 2 teaspoons of the caramel sauce down the center of a warm crepe and roll into a cylinder. Alternately, spoon 2 teaspoons of the caramel sauce onto the center of a warm crepe and then fold it into quarters. This recipe works so, so well with bananas. The marriage between the salty caramel and the bananas is one of those classics in food. Add vanilla Chantilly cream and, or, sautéed apples to your finished crepes for a truly impressive dessert.